What will National Testing Agency do? 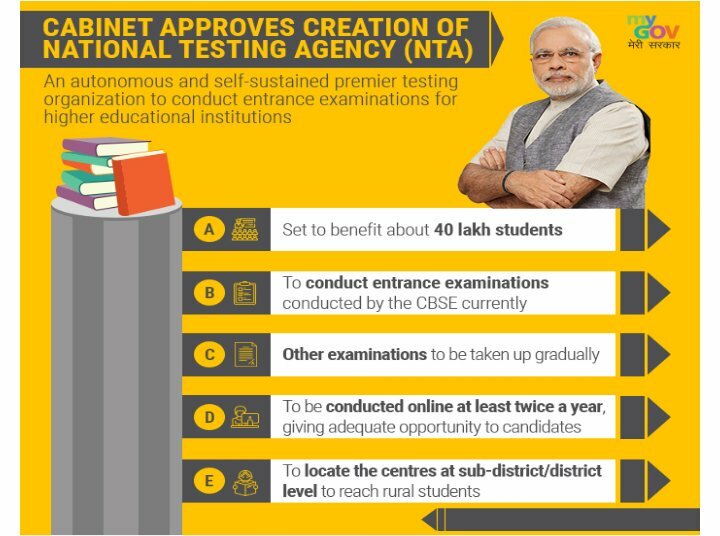 The Union Cabinet chaired by Prime Minister Shri Narendra Modi has approved creation of National Testing Agency (NTA) as a Society registered under the Indian Societies Registration Act, 1860, and as an autonomous and self-sustained premier testing organization to conduct entrance examinations for higher educational institutions. In view of the need to have a specialized body in India like the most advanced countries, the Finance Minister in the Budget speech of 2017-18 had announced setting up of a National Testing Agency (NTA). The NTA would initially conduct those entrance examinations which are currently being conducted by the CBSE such as JEE Main for B.Tech and B.Arch courses, NEET UG for MBBS / BDS courses, National Eligibility Test (UGC NET) etc. etc. Other examinations will be taken up gradually after NTA is fully geared up. The entrance examinations will be conducted in online mode at least twice a year, thereby giving adequate opportunity to candidates to bring out their best. In order to serve the requirements of the rural students, it would locate the centres at sub-district / district level and as far as possible would undertake hands-on training to the students. NTA will have representatives from CBSE, UGC, NCERT, AICTE, HRD. A task force headed by Ex-IIT Director will constitute a seven member task force. The rationale for setting up the NTA lies in ensuring that multiplicity of entrance examination leading to stress on the students is addressed in a comprehensive manner by formulating a uniform entrance examination for admissions in different branches of higher learning. For the first time in the history of competitive examinations, the JEE (Main) and NEET (UG) will be conducted twice before admissions in the next academic session. This gives a choice to the students. This will give more chances to students thereby giving adequate opportunity to bring out his/her best and reducing stress which develops due to single exam conducted on one single day in the year. However, sitting in both the tests will not be compulsory. The two tests (each for JEE (Main) & NEET (UG)) will be equated using psychometric methods, standardisation techniques and best of the equated scores will be used for the admissions. All the tests ( UGC- NET ( December), JEE (Main) & NEET (UG)) will be conducted in multiple sittings and a candidate will have an option of dates to choose from. Scores of different candidates in multiple sittings will also be equated using standardisation techniques. These examinations will use highly secured IT software and encryption to ensure delivery of tests just in time. This will ensure no leakages and other malpractices. NTA will establish a network of test practice centres for students of rural areas so that everyone will have an opportunity to practice before the exam. Schools/engineering colleges with computer centres would be identified and kept open on Saturday / Sunday starting from 3rd week of August. Any student can use the facility free of charge. All tests would be set in a scientific manner with the test items developed jointly by the subject matter experts and psychometricians. Before developing the question papers, the item writers for the exams will be given feedback on the functioning of the previous years’ items so that they are able to make test items which are more valid and reliable. All the above mentioned examinations will be held in existing number of languages. As a student, what should I know about National Testing Agency? We suggest students to focus on exam preparation without any changes to plan for ongoing academic session. JEE Main and JEE Advanced are of course happening now. Whether or not they will get replaced will be made clear by the authorities concerned well in time for next session. Is there any official website for National Testing Agency? Yes. Official website of NTA is nta.ac.in. Also now you can keep track of NTA happenings through news and MHRD website. MHRD further suggests that NTA could play an important role in education system. It may look after outcome learning and outcome assessment. We are keeping an eye out for more news on National Testing Agency. Also details of entrance exams that it may hold. MIT WPU 2019 Admission - Apply Now!! Disclaimer: This website NTA Exam 2019 is only to provide latest informatin and updates of NTA Exams 2019 to students. Users can know about NTA JEE Main 2019, NTA NEET 2019, NTA UGC NET 2019, NTA CMAT 2019, NTA GPAT 2019 and all other NTA Exams 2019 here. However this is not the official website of National Testing Agency (NTA) 2019. Users are requested to exercise best judgement while assessing information available here. Before taking any decision, visit official website of NTA. Thanks and wish you best of luck for your exam! UPES Dehradun Application 2019 Closing Soon - Apply Now! !